John Morse served as President of the Colorado Senate until a recent recall vote ousted him from the position. What had he done to invoke the wrath of the people? Pushed for gun control restrictions in Colorado in the aftermath of the Aurora (Colorado) mass shooting. I’m not going to take a position on gun control, but I do want to point out a major faux pas committed by Morse in an article he wrote for The Daily Beast (Rampage. Regret. Repeat.). 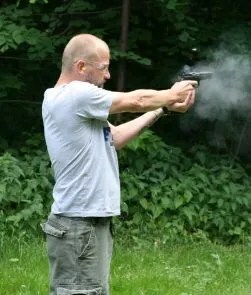 Man Shooting Gun, thanks to milan6 over at sxc.hu for making the image available royalty free. Morse’s article outlines five focuses of his endeavors in the Colorado Senate including (1) limiting new magazines to be limited to 15 rounds, (2) everyone must pass a background check before purchasing a gun, (3) the gun buyer has to pay for the background check, (4) training for a conceal-weapons permit must occur at least partially in person, and (5) proactive removal of guns from the possession of domestic violence perpetrators. Whatever you may think of this legislation, Morse’s primary mistake is earlier in the article. At the beginning of his article he notes how as a paramedic he was called to a home where a husband used a shotgun to shoot his wife in the head (resulting in her death) and then turned the gun on himself…All the while, an infant child is in the room watching. Why is this problematic? Because it reinforces pro-gun supporters fears. Let me explain. The great fear of pro-gun advocates is that we are on a “slippery slope” towards firearms restrictions which will become ever more stringent. The legislation Morse passed would do nothing to stop this sort of violence – and pro-gun supporters know this – and thus know if that if these sort of cases are the impetus for gun control, then it is only a matter of time till gun control advocates see that previous legislation didn’t eliminate these cases and they propose yet stringent measures. “But wouldn’t taking away this man’s gun have prevented this violence?” Unlikely. Gun restrictions may help reduce the body count in mass shootings but is unlikely to eliminate or reduce (imho) crimes such as the one Morse outlines above. If the offender in this case didn’t have a shotgun, he could easily have used a baseball bat or knife. The casualties would have been just as severe – and the trauma inflicted on the child would be equal or greater to that the child experienced seeing his mother and father shot (a gunshot blast is fairly instantaneous, bludgeoning or stabbing can be a complicated process). Nor, from the information Morse provides, would this individual have been prevented from purchasing a gun by the legislation Morse passed. Shotguns are generally low capacity – sometimes one or two shots, sometimes five. It is possible this individual had crimes in his background – but Morse doesn’t mention any. Paying for the background check is unlikely to dissuade anyone – I assume this would cost around $10-$15 for a background check. At the most $25. This individual was using a shotgun, not a concealed weapon. Again, it is possible that this could have helped, if the individual had a criminal background – but Morse does not provide this info. – so I assume he did not. Even if he did, proactively taking someone’s guns, even if legislated by law is a litigious action, and I highly doubt that the police force is going to be eager to undertake such proactive procurement except in the most certain of cases. So, what am I saying? That gun control advocates shoot themselves in the foot when they use crimes which arise emotions in us but that won’t be reduced by the legislation they are proposing. Next story FlashControl – A Better Way to Surf the Web. Previous story The Bluehost Update: Waving Goodbye.